Great Wall Company jaw crusher adopts the international advanced technology and optimization design, On terms of reduction ratio and stone crusher performance, jaw crusher has four technical features comparing with other stone crushers.Therefore the series jaw crushers are widely used in mining, smelting, building material industries, Jaw crushers are necessary equipment in stone crushing plant and sand making line, which provides sufficient building materials for national infrastructure construction. What are technical features of jaw crusher in stone crushing plant? 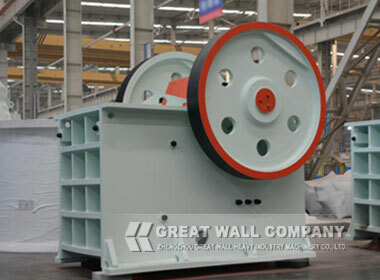 Firstly , Spare parts of jaw crusher are adopts the hadifield steel in mobile jaw, jaw plate, eccentric shaft and bearing.They ensure jaw crusher durable service life.On the second,jaw crusher is convenient to install and has adjustable discharging outlet.Jaw crusher is easy to operate and maintain.Thirdly jaw crusher has bigger feed opening size than cone crusher or roll crusher, the maximum feeding size range is more extensive. Last but not least, PE jaw crusher can be reformed to PEC diesel jaw crusher, which is powered by diesel engine and flexible displacement.Welcome to consult with us on jaw crusher machine and jaw crusher price. Next: What are precautions of jaw crusher debug and operation?